The first road run organised by our Gang of Two was a great success, not least because the weather was glorious. Nine Jeeps, two Land Rovers, a Bedford MW and two Harley-Davidson MT 350 motorbikes met at Harrington’s Carpetbaggers aviation museum before visiting the nearby roadside memorial. Then it was off for a ride around historic American Army Air Force bases in Northants and Beds. First was Desborough where we had special permission from Rockingham Castle Estate to drive around the old aerodrome. Then on to the memorial at Chelveston, followed by a drive around the perimeter track of Grafton Underwood, again by kind permission of the land owner. 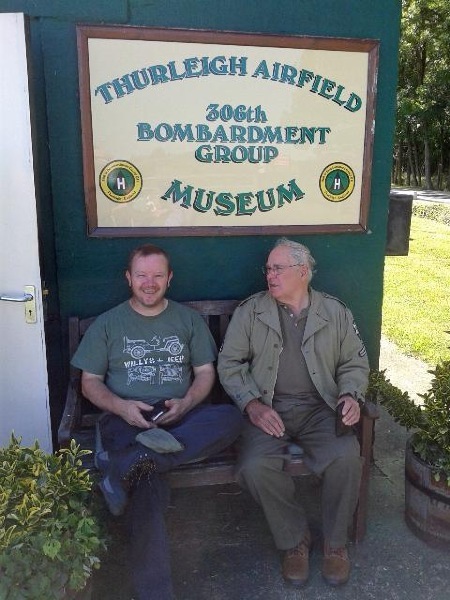 Our last port of call was the museum and memorial at Thurleigh where MVTSEM secretary Ian Gardiner and chairman Neill Elliott were given a well-deserved round of applause for organising such an interesting trip. Rounding up the usual suspects!